What a crazy weekend awaits: Record Store Day, Game of Thrones and Coachella coverage? Oy. Your schedule, like mine, is full but you should make room this week for the items in this week’s Indie Basement, including: the great new album from Sonny & The Sunsets; new Slumberland band Jeannines (who sound like a classic Slumberland band); SeaTac’s Unlikely Friends pay tribute to the the fabulous forefathers of the Pacific Northwest; the Modern Lovers-y sounds of UK band Holiday Ghosts; a new box set of British synthpop; and more reissues from Sweden’s Wannadies. Still need more: Aldous Harding’s new video pays tribute to Jodorowsky and features more great hats; and Mega Bog has a great new single. As to Record Store Day: there are lots of Indie Basement-friendly exclusives this year (Jazz Butcher, Pooh Sticks, Frank Black, The Charlatans), and if you’re in NYC we’ve got a guide to what the local shops are doing to celebrate (in addition to selling you stuff). After years of bouncing around from label to label — Polyvinyl, Fat Possum, others — Sonny Smith decided to start his own, Rocks in Your Head (named after an old NYC record store). Sonny has always done it his own way, though. One of the things I like best about him is no matter what genre he plays around with — country, reggae, synthy new wave and post punk — or who he works with, he always just sounds like himself. His last album, 2018’s Rod for Your Love, paired him with producer Dan Auerbach who cleaned up his sound just a little; things got a little weird with 2017’s Moods Baby Moods which was produced by Tune-Yards’ Merrill Garbus; and here with Hairdressers from Heaven he worked with The Shins’ James Mercer and Yuuki Matthews. All three producers brought something to the table, but it’s always Sonny’s record. In the case of Hairdressers from Heaven, Mercer has a way with sounds that walk the line between low-fi and orchestral, with lots of interesting instrumentation touches, especially on the percussion end. Sonically, this album is a bit of a Sonny Smith Smorgasbourg, with country numbers (“Take a Long Hard Look Down That Long Corridor”), post-punky pop (“Ghost Days”), jangly pop (“Another Life, Another Body”), new wavey singer-songwriter numbers (“Searchin”), and more. (There’s even a serious, skronky jazz instrumental, “Man Without a Past.”) His songs are simple, but the arrangements are always engaging, and I love the wry, searching nature of his lyrics. The whole album is wonderful, but my favorite song is the title track, which is in a sort of ’70s pop style, where he asks the titular hairdressers to “Help me to make sense of myself again.” I love the imagery of him feeling lost as he sings “watch me as I fall through the air like hair onto the checkerboard floor.” It’s nostalgic and sad and playful, which are just a few of this record’s, and Sonny’s, many good qualities. 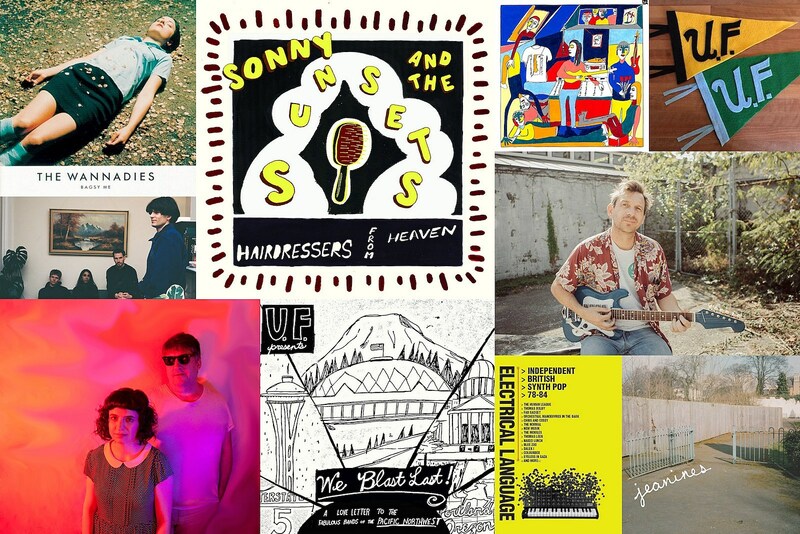 Sonny & The Sunsets are on tour and the band currently includes the great Kelley Stoltz who will also open the shows with the Sunsets as his backing band. Not to be missed and they play Brooklyn’s The Bell House next Friday (4/19, tickets). I can’t wait. If you’re a fan of classic indie pop, be it C-86, Flying Nun or Slumberland Records, Brooklyn duo Jeanines should tick all your boxes. Alicia Jeanine, who writes the songs, and drummer/producer/bassist Jed Smith (My Teenage Stride, Mick Trouble) make what sound like classics: simple, instantly catchy songs informed by ’60s pop and R&B, with ethereal harmonies, minor key melodies, great basslines, jangly guitars and a rough-around-the-edges production that is twee but not too twee. Think Black Tambourine, The Aislers Set, The Bats and Veronica Falls. You can preorder Jeanines now. The band will celebrate the release of their album with a show at Alphaville on June 22 (details TBA). This is my kind of covers record, with the songs bend to their own fuzzy/crunchy power-pop sound while not messing with them too much. You can enjoy this as an Unlikely Friends album without knowing any of these songs, though hopefully it’ll send you off to listen to the originals (like Flop!). This is a free download, or you can buy it on Compact Disc (with a great Sgt Peppers’ style collage of all the bands they covered) and the $10 you spend goes to the Tacoma Humane Society and they’ll match that $10, too. Hailing from the Falmouth region of Cornwall, England, Holiday Ghosts make charming, no-nonsense rock n’ roll, influenced by ’60s R&B and played with genuine enthusiasm which goes a long way to making music like this compelling. It’s a style that has drawn comparisons to The Modern Lovers and I think that’s true in the best possible way. You may have heard their terrific 2017 debut and now they’re back with album #2, West Bay Playroom, which is another winner. Led by Sam Stacpoole and Katja Rackin, who both sing lead, Holiday Ghosts are more of a band this time around (it began as a solo project for Stacpoole) and are generally a little more nuanced, pulling in twangy elements of surf and spaghetti westerns. There are some genre exercises on here, like the instrumental “Cobra,” but songwriting clearly comes before aesthetic. West Bay Playroom is out now via PNKSLM. When it comes to pop and rock music and its many subsets, Britain doesn’t often do it first but they often perfect it. Here’s a box set that makes a case for that with synthpop, looking specifically at the golden years of 1978 – 1984 when synthesizers genuinely sounded like and were treated as the future. Across 80 tracks, Electrical Language goes from the early post-punk days when groups were obsessed with dystopian authors like JG Ballard (The Normal‘s landmark single “Warm Leatherette” is here) through the shiny New Romantic era. Music on Vinyl is also reissuing The Wannadies’ 1999 Ric Ocasek-produced Yeah, which I’m not really a fan of.